Charity stamps, known also as semi-postal, were a great invention to collect charitable funds to support people who need help. Caritas, named after the Latin for ‘charity’ or ‘virtue’, was formed by Catholic members in 1897. Their mission was to make a better world, especially for poor and oppressed people. I consulted the history of Belgium around 1927, but did not discover who Caritas were raising money for in this case. 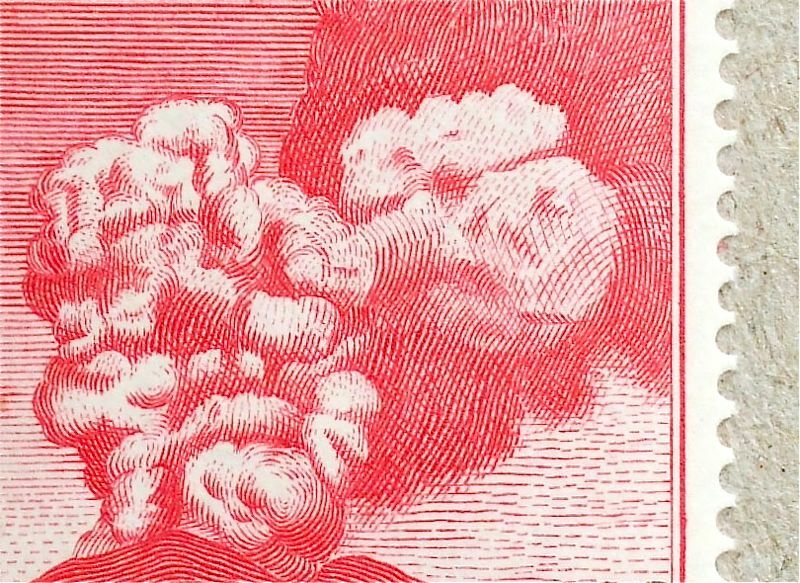 Whoever the people in the boat are, the stamps are in impressive contrast between sad faces and the abstract lines of waves – appealing for help. Just a year ago, people in Europe started to realise that an event of nature can cause great disorder to our modern society. I was in Milano last year today, looking for an alternative route to get out from Milano – it took 25 hours to get back to London through Euro-tunnel. 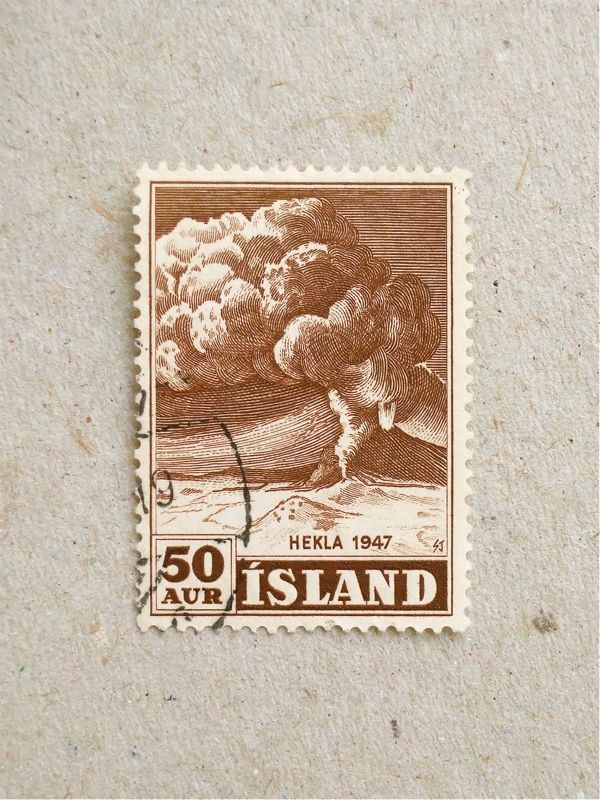 This set of stamps are showing an eruption of Helka, one of Iceland’s main volcanoes, in 1947. 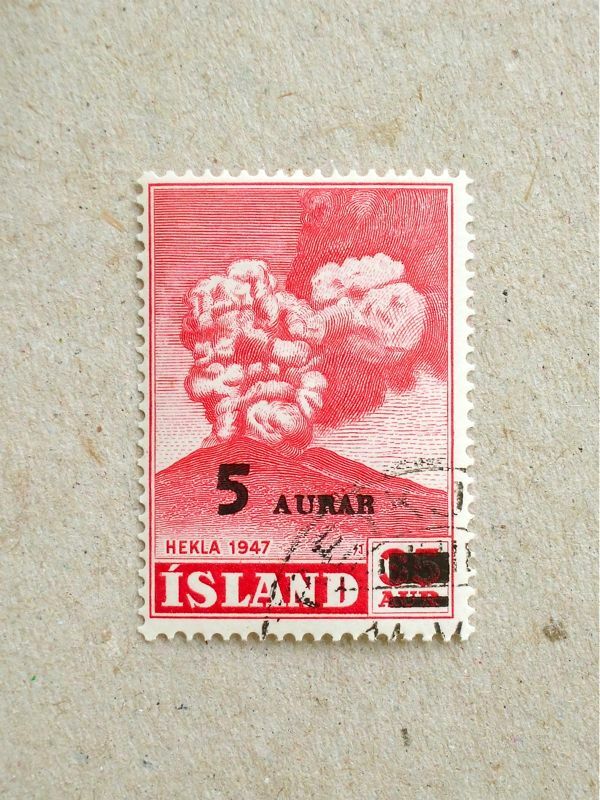 The close-up below shows great needle work by the engraver, signed SJ, depicting erupting volcanic ashes both near and far. Iceland has been supplying most of its required electricity by renewable sources – geothermal and hydro power. And also they are developing hydrocarbon exploration, as they are aiming to be energy-independent by 2050. The seven oldest nuclear power reactors are temporarily shut down in Germany after the Fukushima nuclear incident and discussions on the phase-out process is now dominating the debate in the country. This stamp is from 32 years ago – the length of time that one nuclear power plant can produce energy under the current German law. I am interested in energy policy from different countries since the Fukushima problem and recalling the landscape of places I have visited in relation to that. For example, you find a lot of solar panels on houses in Belgium, where the phase-out of nuclear power is in place already. European cities are not keen to have bright adverts or bright lit vending machines in their towns, and appreciate moody candle light for romantic dinners – but a more radical shift is needed on the manufacturing front and everyday life in the nuclear free future.